“I love the position that I’m in because I get to share some of my culture and really help people connect and pass it down, pass it on,” said Juanita Muise. Juanita is the Indigenous Engagement Coordinator, a new role at UTSC instituted in August. I met Juanita one early morning in the TV Lounge at the Student Centre to learn more about the role. She explained that this was a consequence of Indigenous erasure. In Newfoundland and Labrador, the Indigenous community was all but extinguished, both physically and psychologically. Joey Smallwood, the first Premier of Newfoundland, claimed that there were no Indigenous people left in Newfoundland. In other words, this violent history is accompanied by a tradition of denial. Even today, Juanita said some Indigenous Newfoundlanders claim that “they’re mixed race, they’re not real,” instead of claiming their identity. Juanita also explained how she reconnected with her Mi’kmaq roots after moving to Ontario. 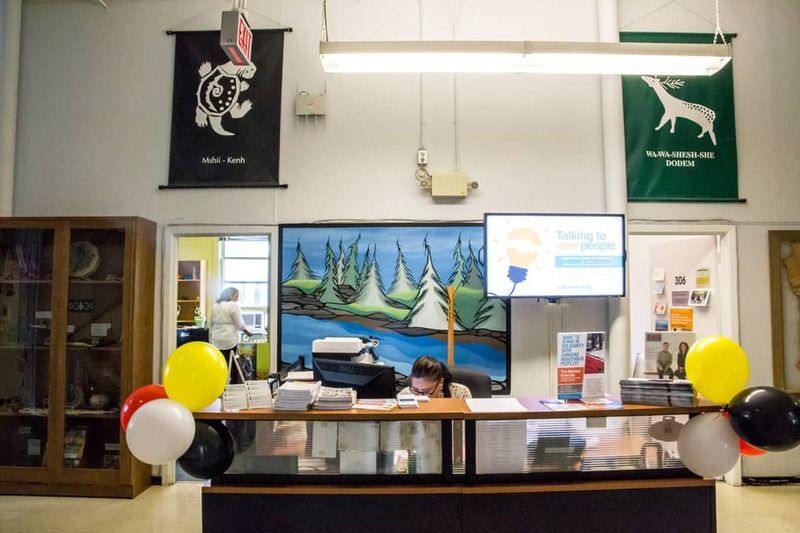 “I went to the Friendship Centre downtown and I really felt like it was open to everybody. There was one lady who was Mi’kmaq and she had a drumming group and I… felt a connection,” she shared. Two themes that Juanita mentioned repeatedly throughout our conversation were community and knowledge. It was easy to tell that she’s passionate about both. When she spoke about community, her use of the word encompassed the UTSC community, the broader Scarborough community, and the Indigenous community. During her undergraduate studies, Juanita became aware of the need for discussing Indigenous issues and Indigenous perspectives. She also emphasized that there can be many reasons why some students don’t identify as Indigenous. For example, there’s a risk of becoming “a token,” especially when there are few Indigenous students around. Students who openly identify as Indigenous are sometimes forced to act as cultural intermediaries, and answer many questions about Indigenous culture and related issues. I asked her what reaction she got. “That’s why I went into education after my undergrad,” she explained. “Even with so much reconciliation in the schools, often I find that our Elders and students are used as tokens, symbols. I’m curious about how Juanita feels about land acknowledgment. The importance of understanding why we do something and what’s behind it was another recurring theme during our talk. Juanita brought up different traditions of knowledge, and the value gaps between them. She talked about the school system in an Indigenous community in the north, where she worked before coming to UTSC. “More than half of their programming is on the land. So, they’re not just following the Ontario curriculum. They’re actually also learning from their Elders… and members of the community, and that took up a large chunk of their learning.” This included learning about medicines and trapping and how to harvest foods. Then, “when they finish grade eight, a lot of these students still have to leave their communities… [and] everything they’re familiar with.” Moreover, Juanita describes how these students are also disadvantaged because during their primary school years, they have had less access to support and special education, as compared to other students in Ontario. Still, she’s anxious to see improvements for the Indigenous community on campus. Her main concern at this point is the lack of space for the UTSC Indigenous Elder, Wendy Phillips. Juanita is told that change takes time, but she feels that finding an office space for the campus Elder is something that should be fairly simple. “That’s another thing about our culture. Everybody has gifts and it’s just about nurturing those gifts that everybody has and to be able to share. It’s all about sharing,” Juanita said.